Posted May 31st, 2018 by admin & filed under Fun, Meetings, Modes. AFCRAS will be sponsoring and conducting a live, hands-on Introduction to DMR Amateur Radio on June 26, 2018. Pre-registration is NOT required, but it would be helpful if you will email the AFCRAS Media Committee as soon as you can and at least a couple of days before the presentation and let us know you’re planning to attend, so that we have some idea of how many people will be attending and how to arrange the classroom. We will meet at Breezeway restaurant (213 S. 8th St in Opelika) for dinner at 6 p.m. prior to the presentation if you care to join us. Breezeway is on South 8th street, only a block from the meeting location. Topics to be covered in this live Basic DMR Workshop/Orientation Program:This workshop/presentation is geared toward any amateur radio licensee (or those interested in getting their license) looking to get started in the exciting world of DMR ham radio. Perhaps you’ve recently purchased a DMR radio (and possibly a “hotspot”) but you’re feeling a bit overwhelmed by it all? Maybe you’ve decided to “take the plunge” but would like to actually put your hands on some of the various popular radios and “hotspot” devices to help you in deciding which new toys to buy? Or perhaps you already have one or more DMR radios and/or “hotspots” but you just want to try out other brands and models before buying another one? If any of these apply, then you will want to take part in this workshop/presentation! How is it different from analog FM? What are the advantages of DMR over analog FM? No DMR repeater within range of your radio? No problem! Excellent for use on-the-go, at home, at work, in your car, from a boat… your imaging is the only limit! This program is being sponsored and conducted by the Alabama Frequency Coordination & Repeater Advancement Society (AFCRAS). 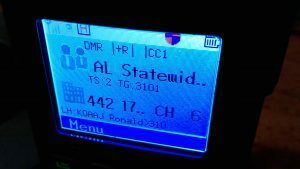 Provider of modernized, convenient frequency coordination services for the Alabama Amateur Radio community, and to education and sharing of information between hams, all for the purpose of carrying out our mission to make ham radio in Alabama more even more exciting and enjoyable.